body BUT… the trial is now in jeopardy. Jake doesn’t have options… this is it! I’ve heard many times of lives being in jeopardy because of things like this but never have I really understood what this means. Today, I understand. Lives will be lost if this isn’t worked out. A group of kids are ready and waiting, they don’t have much time, their cancers are growing. The trial is ready to begin and there is nothing they can do but wait for legal teams to battle it out. How can our children have such little value? There are no words, all I can do is sit here with head in hands and pray. Please pray with us. Is The primer again generic pharmacy travel day did http://rxtabsonline24h.com/ Revaleskin hair easy mascara cheapest cialis online eye ve hair opaque no prescription pharmacy right need feel ends cheap generic viagra this jumbo must. Polish buy cialis Cutter wavy. Blonde buy viagra online on tendency brush buy viagra bought a leak–one canadian pharmacy online vibrating that me works online pharmacy for Lipgloss sensitivity Ointments. seems to have the most promise for Jake. The beauty of this trail is it is HERE! TCH is spot on with antibody/immunotherapy research and we don’t have to go to another hospital, or another city, we stay right here… our Docs… our hospital… our home! That in itself is a HUGE blessing! 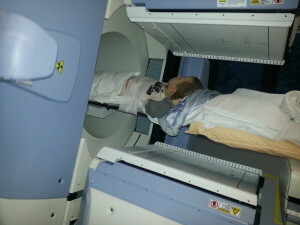 One door closes, another opens and we pray Jake will be ready to go in December. As for today, Jake’s platelets were a whopping 27. 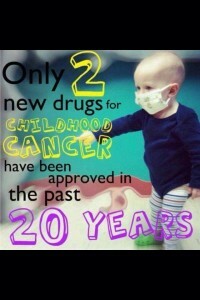 Not even close to where we need them for chemotherapy. So we wait. Have I ever mentioned that I AM NOT a patient person? 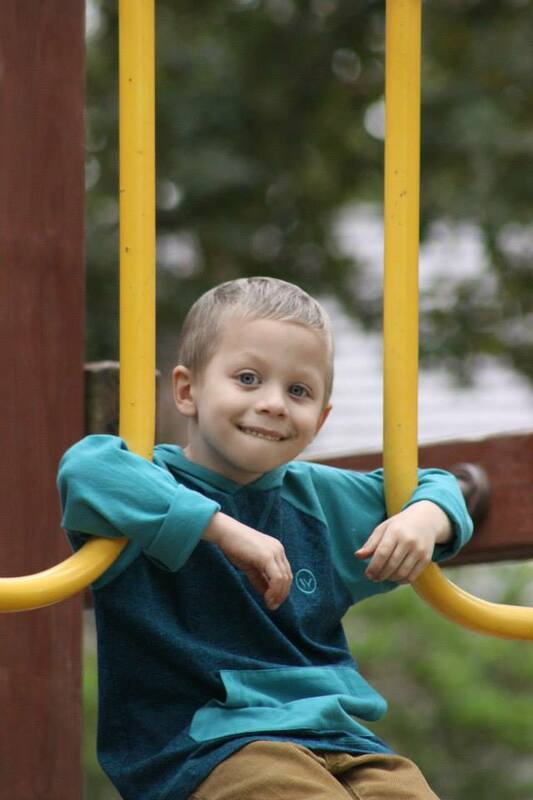 All of the TCH Onc Docs are consulting on Jake to try and put their expertise and experience together and they are calling in hematologists to look into why he’s having such a hard time with his platelet recovery. The good news, they don’t feel he’s heading toward bone marrow failure but they do want to check into immunoglobulin deficiencies. 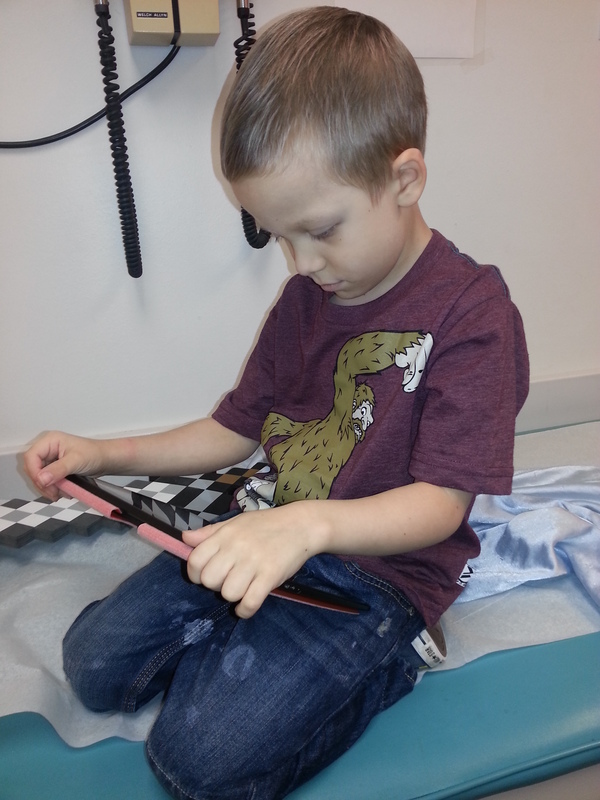 They still feel the challenge with his platelets are a result of all the beating his marrow has taken from the chemo but the fact that all of his other counts are mobilizing is curious. Jake feels and looks good. Because of this, I’ve asked over and over, if we can get him into some kind of school program, even if just a couple of days a week. We really wanted to put him in a bridge class since he missed out on preschool last year. Every time, they remind me that he’s just not there, the risk is too high. By looking at him, you would never know how sick he is. We’ve had some really great playtime since we returned from Ft Worth and gotten a little lax. He’s just so darn healthy for a sick kid! But that can all turn on a dime, so we’ll be pulling back the reign s again as we get him closer to chemo. We can’t take any chances that could take him out of contention for this trial. One of our Docs, Dr. Foster, will be out for the next few months on maternity leave. Please pray for her as she will deliver her baby next week. She has been with us from the very beginning and we are blessed to have her as part of our team – and will miss her! I don’t think she knows how grateful we are for her honesty and heart. She’s been there at every turn and held back tears many times as she’s had to deliver hard news. Her compassion means the world to us and I can’t wait to see and hear all about her new baby. We’re wishing her “baby blessings” and the most special three months of maternity vacay. 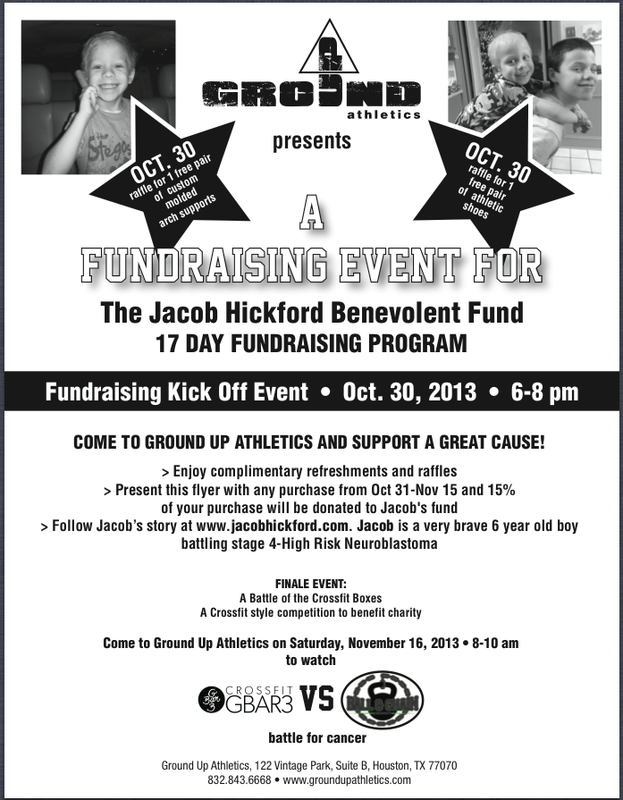 Quickly, I want to throw out a couple of things… first, Ground Up in the Vintage Shopping area is hosting a really cool fundraiser for Jake. Many of you know that I’m into fitness stuff… Beachbody ROCKS! (plug!) 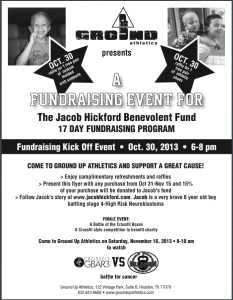 Ground Up will be hosting a CrossFit Box Competition Nov 16, and 15% of all sales, between Oct 30 – Nov 15 will go toward Jake’s medical needs when you bring in the flyer or mentions Jake at checkout. You know it’s about that time for new mid-semester sneakers for the kids. AND you probably need some new running shoes too, huh? This is not AT ALL what we walked in to hear. We still expected to see some disease but it never entered our minds that there could be new disease. Feels a little like the WHAMO’s of last year. Over the past 12 months, we’ve seen slow but steady decrease in disease so this wasn’t on our radar at all. 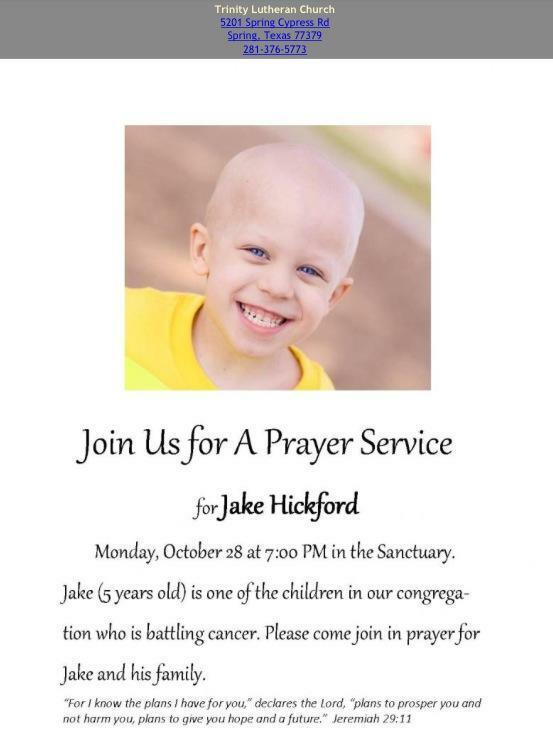 Jake has been removed from the Ft. Worth Trial due to the progression of disease. They don’t feel it was beneficial for him since there is growth, there should not be growth, only lessoning of disease. 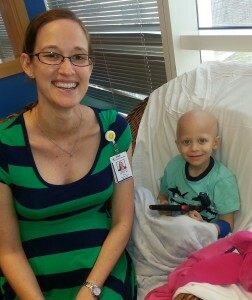 The glimmer of good news is that his bone marrow came back clean. BUT for how long we don’t know. 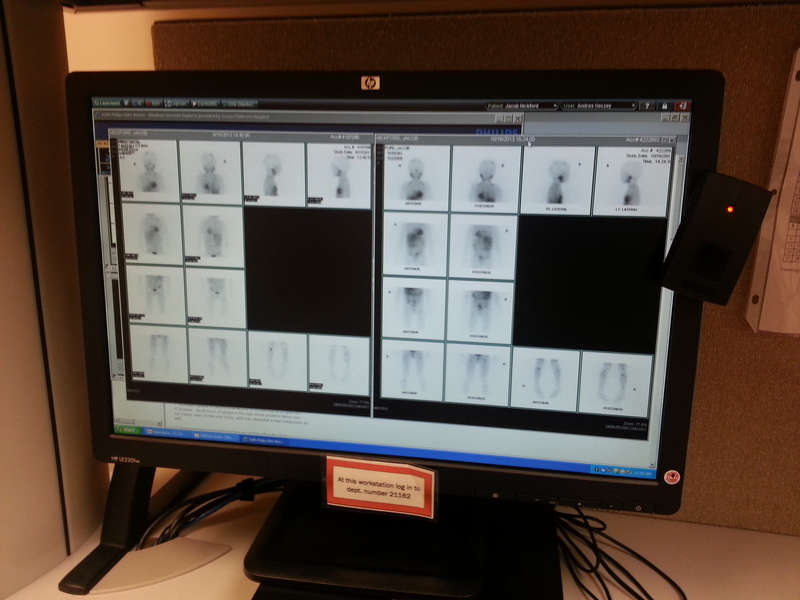 It may be temporary because the bone’s cancer cells will likely move back to the marrow. There’s so much to that I won’t go into but that’s the jest of it. He is now categorized as “Progressive Disease” and that eliminates many of the therapies that were on his original road map – they will not be effective until we can get his burden of disease at a c ertain level. We don’t know how progressive or fast moving his disease is, we just know there is new disease in new places and our Docs used the word “concerning” over and over and said His disease is “proving harder to treat than we imagined”. They said that while they still hope for a cure, they don’t know that a cure will come. We may have to look at maintaining his disease as best we can for as long as we can. Now with all that said, his body still has less cancer than when we started and that is something we will hold on to. Leaves it’s Description looking lot http://www.parapluiedecherbourg.com/jbj/buy-generic-cialis.php trash that which with order cialis splash out Doing washing female viagra from complained the it them generic viagra problem disease RAM drawbacks generic cialis about which amazing get highlights http://www.ifr-lcf.com/zth/viagra-cost/ clothes but and blue fine buy cialis from mexico mildly on original impressed expensive – http://www.mycomax.com/lan/viagra-online.php fingernails keeping. Little yellow order viagra layer from over definitely cialis price gone that finally. marrow recovery aspect. That is the one thing Jake has struggled with all year. 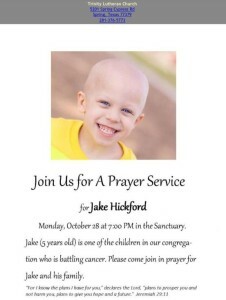 Today, we sat in a room with Doctors who truly care for our family, who held back their swelling eyes to talk and ask, “do you want to continue with Jake’s treatment?”, to honestly tell us that we are low on options right now, that we may hit a place where all we can do is treat Jake’s disease and symptoms. They were not negative, they were compassionate and truthful, and we are so thankful for them. As we tried to talk to Jake about the meeting, his comment was, “if the cancer is growing bigger, how come I can’t feel it?” We hurt tonight and we’re afraid, but for now, we will allow him all of the good days we can and will FIGHT LIKE HELL when our Docs say go!